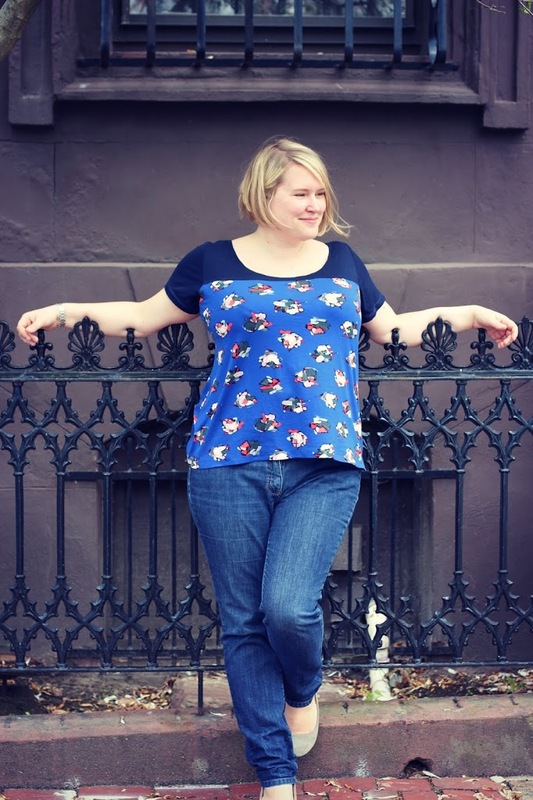 One of the great things about hosting the Everyday Casual sewalong for Sewing Indie Month has been discovering new pattern companies – there are so many popping up that it’s hard to keep up! As I was looking through all the new-to-me companies who are part of the initiative, one that really stood out was Sinbad & Sailor, who have a small but lovely set of RTW designer-inspired patterns. S&S just launched the Hepworth Dress which is doing the rounds of the blogosphere, but I decided to give their Christopher Kane inspired Dove T a try. From the front it’s a fairly classic darted woven top (I omitted the sleeves) but from the back… it’s a whole other story! I know what you’re thinking now. This silk is FABULOUS, is it not?! Well, thank you very much to Britex Fabrics, a sponsor of Sewing Indie Month who incredibly generously gifted it to me for this project. 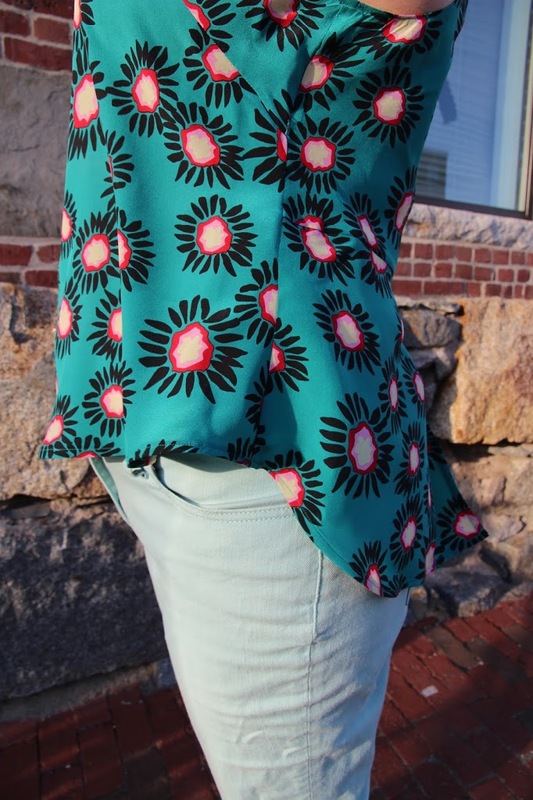 I am absolutely head over heels in love with the print (which is “perky” according to the description), and it’s exactly the kind of amazing and unusual fabric that Britex specializes in. It’s my first stop when I’m in San Fran! Somewhat inadvertently, I made a a high-low hem, but I actually really like it, and it gives a little bit more swoosh to the back panels. I did a narrow hem using Andrea’s fantastic serge-and-turn technique – worked like a charm, and no little bits peeking out for once! For the neckline and armholes my original plan was to bind, but then I realized that my pre-bought binding would be altogether too stiff, but there was no way on earth that I was going to make and install self-fabric silk binding. So instead, back to my recent discovery: Wonder Tape! This was *the perfect* approach: I stuck the Wonder Tape to the edge of the neckline, turned it over using the tape as the measure (it’s 1/4 inch), turned it one more time and then stitched. DONE. So little hassle, and looked so perfect. All in all, the Dove T is super easy to whip up, bust some of your stash and be a teensy bit different from all the silk tanks out there in the summer. Plus you get a breezy back! DON’T FORGET: ENTER THE EVERYDAY CASUAL CONTEST! 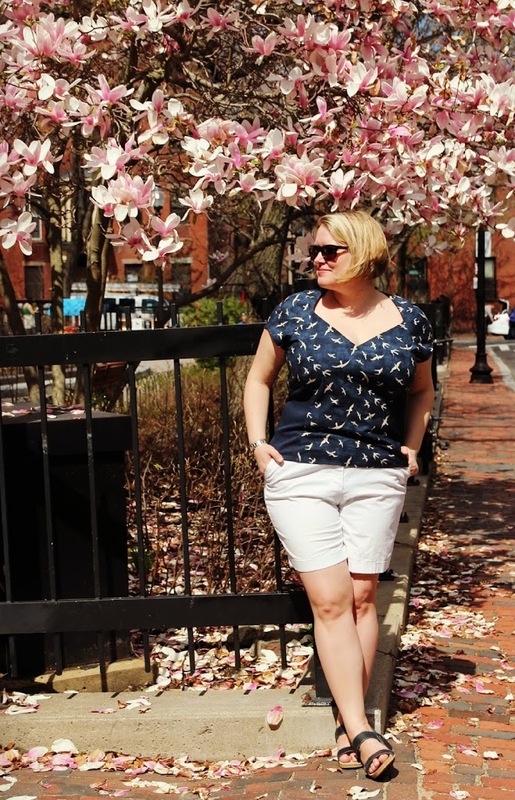 You can enter the Sew Indie Month everyday casual contest and win amazing prizes by submitting a link to your blog, Pattern Review or Kollabora on this page. Can’t wait to see them! 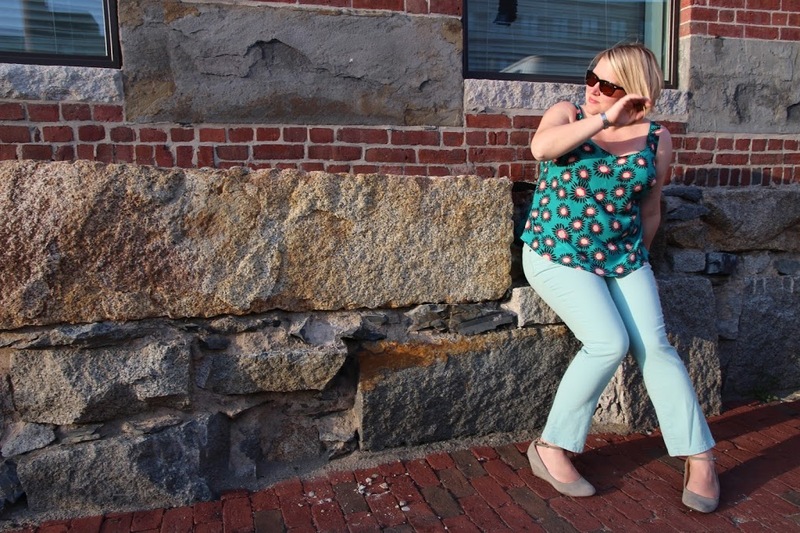 The Seamster Dandelion top: the most innovative top ever?! 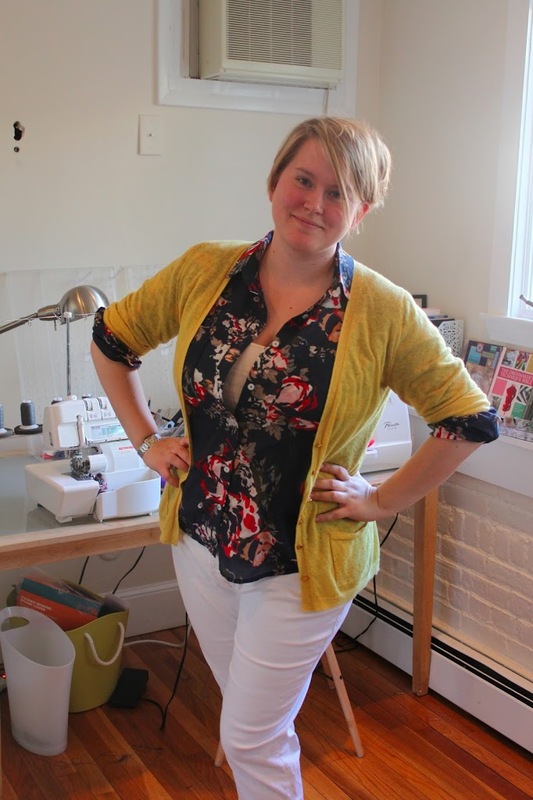 i love hannah’s patterns and she’s a lovely lady too (of course, sewists always are!). i made the magpie dress for my holiday last year in turquoise linen and i’m planning another in lawn for this year. i’ve also got a hepworth in my sights! i love your dove tee! Thanks! I’m looking forward to trying some more of the patterns, although I hope they’ll start going up a few more sizes so I don’t have to do too much grading! For realz. The silk is on sale so you should snap some up ASAP! Ooh that’s a great tip, I will give it a go in the future! Really cute!! 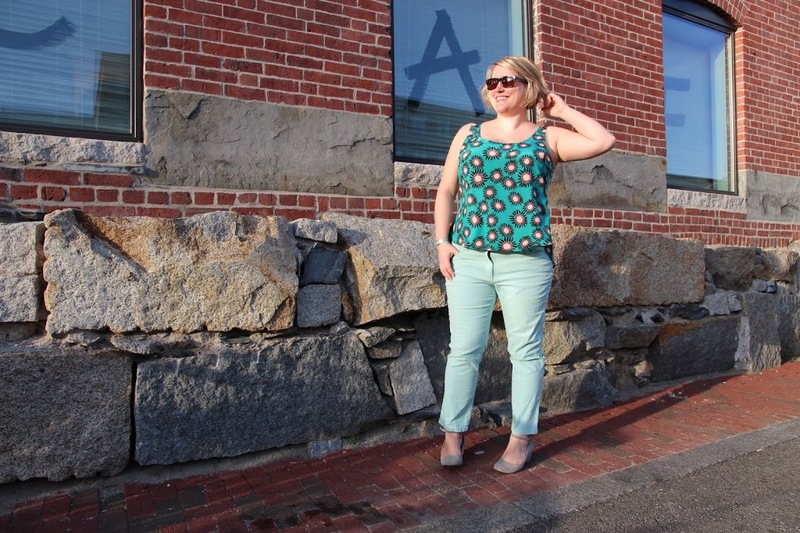 That print is certainly vibrant and summer-ific! Thanks very much, that’s really kind!